A unique, beautiful woman is no longer with us. She was our mother, grandmother, great, and great-great grandmother. She graduated from Marysville High School in 1922 with a personal motto of "Happy and Contented Am I". She married Pearlie S. Byrd, the love of her life, that same year and they shared life together for forty-two years. 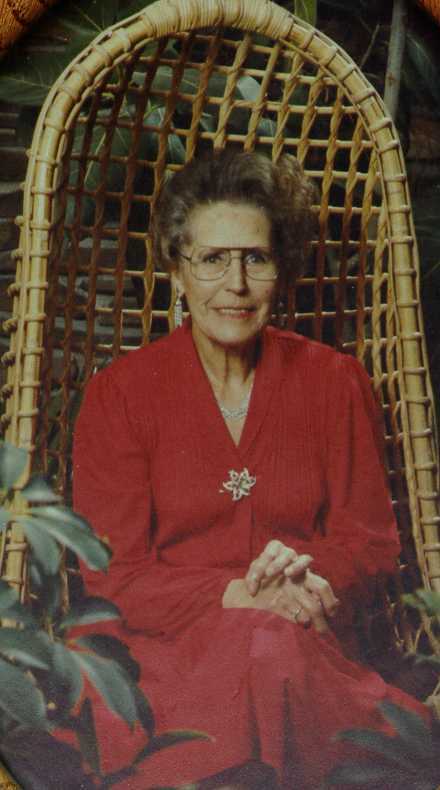 She devoted her life to family, friends, home and the plants and animals that flourished there. Mom was attracted to the arts all of her life, expressed by her love of music and books, and the many poems she wrote and published. She loved her country and served in the Ladies of Elks for many years. A memorial service was held at 1 PM, Thursday, July 6, 1995 at Jones and Jones chapel, Wenatchee, Washington. Memorials were made to the Washington State Elks Therapy program. Mama was our friend and teacher and we will miss her.